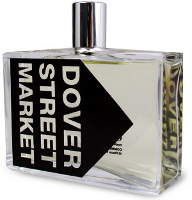 Dover Street Market is supposed to be a "modern twist on a classic woody fragrance"; the opening is a strong, spicy blend of incense and citrus, accented with plenty of juniper and pine (the notes include bergamot, mandarin, black pepper, coriander, incense, juniper berry, cedar, labdanum, patchouli and pine). It's bracing (and, as that might imply, more masculine than feminine) and lively in the early stages, although it lightens up rather quickly; later, it's a softer, smoother, almost-transparent incense fragrance. If it sounds like something that might fit neatly into the Incense series, that's not quite right: it's doesn't have the atmospheric feel of those scents, and the early stages feel more like a standard peppery citrus for men livened up with some incense — I'm tempted to say it belongs in the Cologne series, but it has more sillage and lasting power than that might imply. Dover Street Market is a pleasant, wearable fragrance. For my money, I'll stick with the more unusual Ouarzazate when I want something in this vein, but if you still haven't found an incense to love from Comme des Garçons, it's worth a try. Comme des Garçons Dover Street Market is available in 100 ml Eau de Toilette, $90; for buying information see the listing for Comme des Garçons under Perfume Houses. 1. I didn't get to smell the H&M scent. The notes are very similar, and at least one commenter said Dover Street Market smelled identical to H&M. If you smelled both scents, do comment! Interesting. I went to great lengths to buy that H&M scent on *bay and didn’t love it exactly. I’m hoping I get some wear out of it this winter, but it was a very cedar- & pine-heavy incense. Dry as a bone. As I’ve mentioned, I have a slight problem with pine/fir/balsam type notes. I’d gladly swap you a sample of H&M for a sample of Dover Street Market! Hmmm…it isn’t sweet, but not sure I’d call this dry as a bone. Wonder if they took the H&M scent and tweaked it a bit? Certainly no fruity-floral this one. I like pine/fir/balsam notes, plus dry smelling perfumes so I bet I’d like this one. To my nose H&M was a very strong blast of citrus & pepper followed by a strong cedar/incense. I don’t recall much pine, and the incense was simple, strong and powerful – more like Hinoki than the incense series. This new scent sounds like it may be lighter than the H&M scent, but I haven’t had a chance to compare the two. This one has cedar too, but the pine is noticeable. Not November here either, M. Which is fine with me! My question: I’m going to Boston next week for a conference, and want to do some sniffing. I will be in the Back Bay, and have already planned at least one pilgrimage to the Copley Place Barney’s to test some of the Lutens line (first time ever for me!). Are there any perfume boutiques or other good sources in Boston that I should not miss? I live in a very, very, very small, provincial city, and am happy to mail order — in fact, I have already ordered samples from a couple of vendors I learned about from the blog — but I’d really like to smell some of the more challenging fragrances in person, with the option of instant gratification. If you have the time, be sure to stop by Neil Morris Fragrances, 221 Massachusetts Avenue, Suite 501 (ph 617-267-2315). The website is http://www.neilmorrisfragrances.com, if you want to check it out in advance. The prices are reasonable; the fragrances are wonderful, diverse and long-lasting; and the limited contact I’ve had with Neil and his partner David has been extremely pleasant. I don’t work for them in any capacity–I am just a very satisfied customer. Wish I could go with you! Have a great trip! I can chime in as a Boston-dwelling perfumista: Barney’s is a great jumping-off point if you’re in the Copley area. Make sure also to visit the Neiman Marcus , which is also in Copley Place–I’ve found that if you chat up the SA’s there, they’re pretty generous with the samples (esp. the Goutals). Saks, in the adjacent Prudential center, is a veritable goldmine of testers (rare Guerlains, Diors, Bond no. 9, etc.). If you walk down Newbury St. towards the Boston Common, you can also visit Lush, which is great for its soaps & scents (if you can stomach the miasma of patchouli seeping through its doors). And best of all: the Hermes and Chanel boutiques are one block from each other, both bordering on the Common. I’ve found the Hermes staff really helpful and generous if you show interest in their scents (and their samples are HUGE!). I’ve been to Colonial Drug and have to say my experience was nothing to write home about. Though they do carry some hard-to-find scents, the samples are mostly behind glass cases, the gentleman behind the counter wasn’t particularly helpful, and I found the prices to be exorbitant. Yes I’ve been in Drugstore too. They only had one Acqua Allegoria, when I was looking for a harder-to-find one. And the store was kind of depressing and generic after all. Skip this one. You absolutely must stop by the Hermes store on Boylston St. if you’re not familiar with the Hermes line. Then you can go on the botanical walk through Boston Commons afterwards. Wow, thank you all VERY much for the suggestions. The problem will be how to fit in all these excursions between conference sessions (we go from 8 a.m. to 6:45 p.m.). I suppose I could play hooky? Yes, overshadowed by the Daphne, and in my case also by the Artek, which is just more interesting than this one. I own both and did a side-by-side of H&M and DSM. H&M has more cedar at the top and DSM has less cedar which intensifies as it develops. By the middle both scents smelled the same on me. I think this is good because I thought H&M could have been a big mainstream hit for CdG. It will be interesting to see if DSM lives up to that estimation. I agree if you are a confirmed incense lover the other members of the CdG incense line are more interesting but DSM could be an awesome “gateway” incense fragrance. Thank you so very much! Glad to know they at least tweaked it a bit…seems cheeky to use the same scent over again. But have seen less interest in this one than for the H&M, which had the added hype of the clothing collection. And of course, “Limited Edition” often brings out the crazed consumer maniacs in many of us. So I’ve heard….. I also own both and find them very similar, though I prefer the Dover, as it’s more rounded and “rich.” The H&M is a bit strident in comparison. But both strike me as close cousins of Zagorsk, so if you have one of that trio, you will not need the others. Thanks for another comparison! I like Zagorsk better.